For those waiting for Brock Lesnar’s return to UFC and a heavyweight title fight with Daniel Cormier, which has been teased since an in-cage shoving match this past July, Dana White gave the impression that nothing is imminent. Both White and Cormier had talked about the potential of such a fight since Cormier defeated Stipe Miocic for the heavyweight title on July 7, 2018. While Lesnar doesn’t have a sanctioned UFC victory since 2010 and turns 42 in July, he was a huge draw during his 2008 to 2011 UFC run, which saw him win the heavyweight championship. He also had a 2016 win over Mark Hunt that was overturned due to testing positive for a banned substance, Clomiphene. ”It’s what we wanted to do, but we haven’t even talked to Brock,” White said. Lesnar has remained in the public eye since leaving UFC, as one of the biggest stars in World Wrestling Entertainment. He was the Universal champion in that organization, a credential that doesn’t have sports credibility but does point very much to his marketability and perceived star power in that world. He dropped that championship to Seth Rollins at WrestleMania on April 7 at MetLife Stadium in East Rutherford, N.J., before more than 70,000 fans. That, combined with him having no WWE matches scheduled going forward, and stories breaking regarding a possible late summer title fight with Cormier, led to much recent talk. 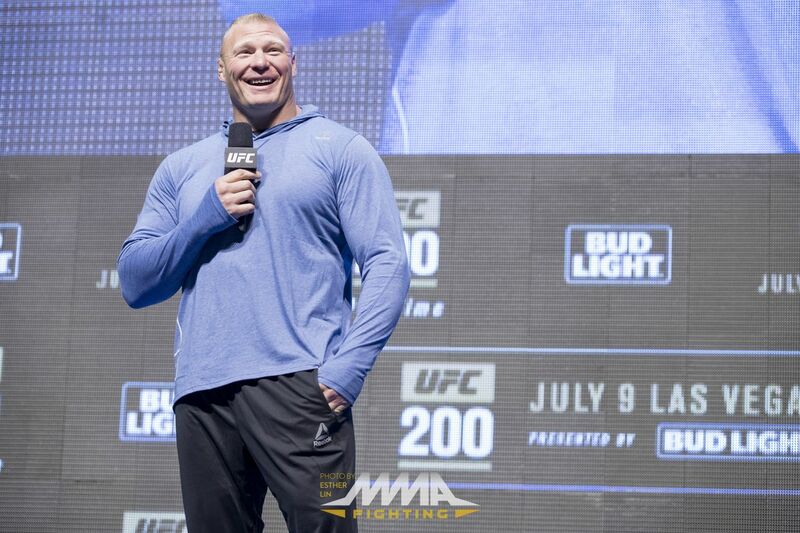 WWE even used that in an interview segments leading to and after WrestleMania, where both Rollins and Paul Heyman, Lesnar’s television mouthpiece, talked about “ultimate opportunities” and Lesnar going to Las Vegas, the home of UFC. But White indicated differently, going so far as to claim there have been no talks. White also noted that they can’t confirm a date for a heavyweight title fight because Cormier is still bothered by injuries.